Use Santa to help your students learn language skills this holiday season. 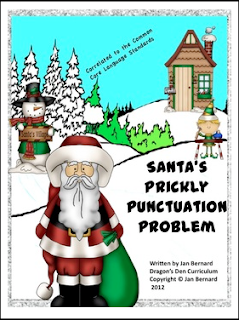 This Freebie includes a five page read-aloud story about Santa's punctuation problem, followed by two language worksheets for each grade level from first to fifth. Each worksheet has the common core standards it addresses in the lower right hand corner! If you would like to receive 1/2 off of all new products during their first 48 hours of launch, click on the "follow me" button next to the green star!